Treasury role inside Bank Organisations have been changing over the past 10 years, since of Financial Services market dynamism. Historically Banks have always been able to make profit basically through a standard, even if complex, maturity ladder transformation. Market rates structure and lack of a structured regulatory framework have allowed Banks to keep high margins on cash lending. On top of that, those Banks with a deeper know how in capital markets, have been able to leverage it to position themselves as financial intermediaries in investment banking. As major goal was to increase volume of managed cash and trades, growth and RoE were the key measures of success. That context allowed Banks to adopt a simplified operating model, where Treasury role was to manage liquidity through an effective manner and support Business to generate profit providing guidelines on interest rates margin to be applied to Clients. On the Investment Banking side, intermediary commissions were usually applied on a transaction basis, then making Treasury role totally transparent from a Business perspective. Within the new current context, further complexity factors have made more complicated the core business of Banks and especially the role of Treasury. As major complexity factor, a new regulatory framework has been implemented, where Dodd Frank, Volcker rule and Basel III represent the main drivers for change. 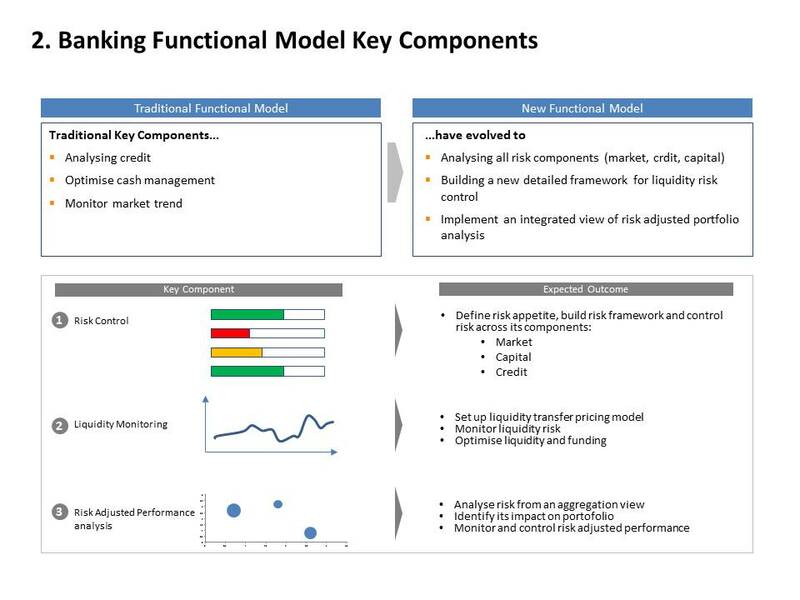 Market, credit, capital and liquidity risks have become key components of the operating model while risk control has become a strategic capability to create value. As a consequence, capital ratios have become crucial indicators to monitor and concept of risk weighted assets have spread across Financial Services. Risk Management has then started implementing a risk adjusted performance monitoring framework, where ROI based indicators (Return on Investment) have been replaced by RORAC based ones (Return On Risk Average Capital). More recently, legislator has realised that capital and financial market stability fundamentals are not relying only on solid capital ratios but also on Financial Institution liquidity capacity. Hence Basel III for EU and FSA for US have introduced specific guidelines for liquidity ratios compliance, which should be kept together with capital ones. 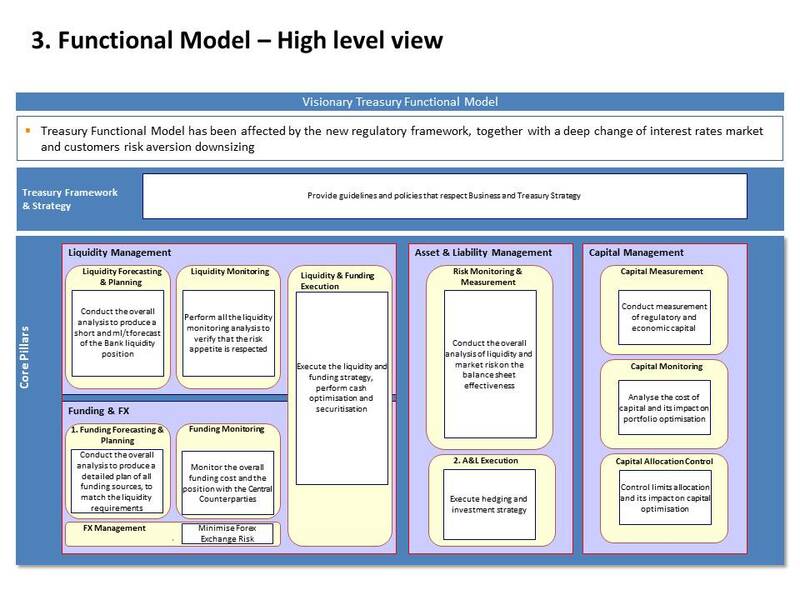 This new regulatory framework, together with a deep change of interest rates market and customers risk aversion downsizing, has substantially modified Financial Services operating model, where Treasury and Risk have taken a strategic role to sustain Banks risk-adjusted performance. In the detail, Risk Management has become accountable for the creation of a solid risk framework, defining risk limits, policies and models, in order to monitor and control all market, credit and capital risks affecting the Bank credibility and performance. • Control limits allocation and its impact on capital optimization. 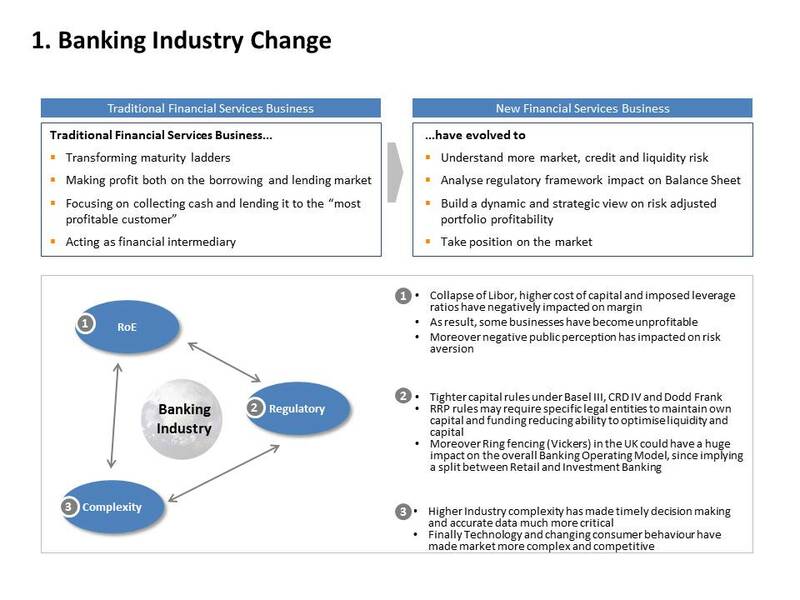 Some Banks have already recognised the new role of Treasury and have already started reshaping their operating model. Many others have still to realise of the deep change that the new regulatory framework will bring inside Financial Services. In the next articles we will provide you with a “visionary view of the Treasury role adoption”. Perché le imprese non hanno accesso al credito ?